Pool can be very daunting because the technical aspects of the game are not simple to execute subconsciously. However, the more you can reduce the variables, the simpler the game of pool becomes, and the easier it is to play the game with a positive mindset. The first step in mastering the game of pool is learning the correct fundamentals. Fundamentals are the elements that all great pool players have in common. Good mechanics provide a solid foundation for you to perform the actions that your mind tells you to do. All too often it’s something simple that keeps a player from reaching their true potential. In fact, the focus of this article is to address quite possibly the most common fundamental flaw among players. Over the course of several years of teaching I have trained several hundred students and nearly all of them had one common problem. The weakness I am referring to is their BRIDGE HAND DISTANCE. Furthermore, I would venture to say that 95% of all pool players place their bridge hand too far away from the cue ball. Being able to make a stable and accurate bridge is a very important part a player’s mechanics. Pool has drastically changed over the years. Today, most players play on tight equipment where that accuracy is the name of the game. A sloppy bridge won’t help! Moreover, we are conditioned to reproduce what we see from professional players like Earl Strickland and Johnny Archer (both very tall in stature). 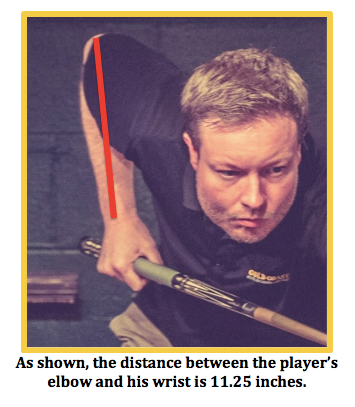 What most players don’t seem to understand is that correct bridge hand distance is directly related to a player’s arm length. Generally, the taller you are the longer your bridge should be. The purpose of the bridge is to support the cue on the line of aim by forming a groove or channel for the cue to slide through. The bridge hand is usually placed nine to twelve inches away from the cue ball depending on the layout of balls and the player’s unique body structure. It’s actually quite common for players to miss shots because there is too much play (bridge distance is too long) between the groove of their bridge hand and the cue ball. To find the correct bridge hand distance for your body structure, measure the distance between your elbow and your wrist. 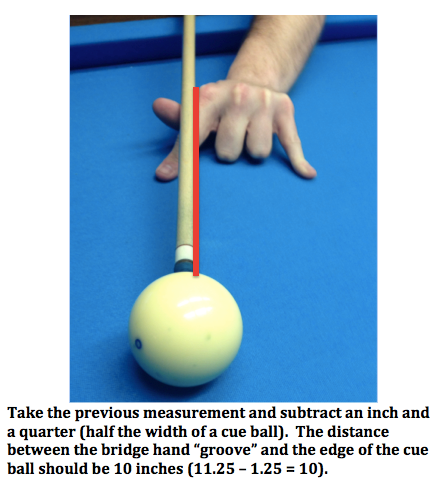 Take that measurement and subtract an inch and a quarter—that’s how far the groove of your bridge hand should be away from the edge of the cue ball. If you place the groove of your bridge hand closer than that you will gain accuracy but lose power. Conversely, the opposite applies when your bridge is too far away from the cue ball. If your channel is too far away then you will lose accuracy and gain power. Keep in mind that the table layout can interfere with a players ability to maintain their correct bridge hand distance all of the time. They key is to remember that the correct bridge hand distance should be used when conditions permit. Another thing to remember is to keep the bottom of your bridge hand planted firmly against the slate of the table. This will make your bridge hand more stable and will allow you to guide the cue more accurately. In the words of Wyatt Earp, “Fast is fine, but accuracy is everything.” The bottom line is if you want to play like a professional, you’ll need to master correct bridge hand distance. There is no shortcut! If you want to improve your game don’t neglect this area. It’s a common problem that has been plaguing players for years.